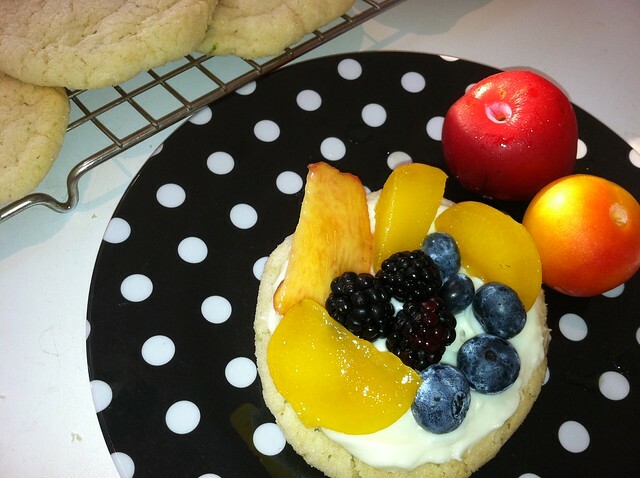 fruit pizza cookies – ugly food tastes better. Let me be clear. This is a dessert. My mother made a giant version of this when i was a kid in a round pans and called it fruit pizza, which i loved. Now i make versions all summer and people look at me with their head tilted until I say “like a tart!” and then they dig in and bow at my feet. This time around, I decided to one-up myself. Usually I get lazy and use store bought sugar or choc chip cookie dough (I know, i know) but now that I’ve gotten all into this food blog crap, i feel inspired. 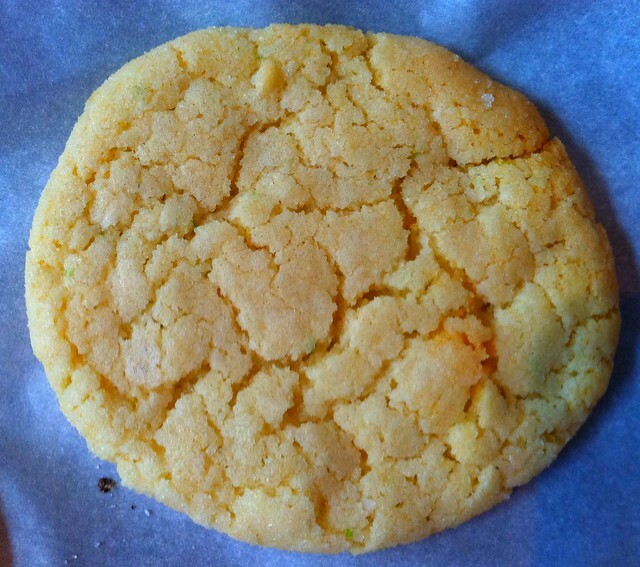 I found a fabulous chewy lime and coconut sugar cookie recipe that looks insane and am going to use that instead. It seems perfect, as the “sauce” for the pizza is suagr and cream cheese, and the cookies have those ingredients as well. Now, I am not sure what the exact protocol is for stealing someone else’s recipe, but this one is on like 15 blogs, and evidently originated from Cook’s Illustrated. 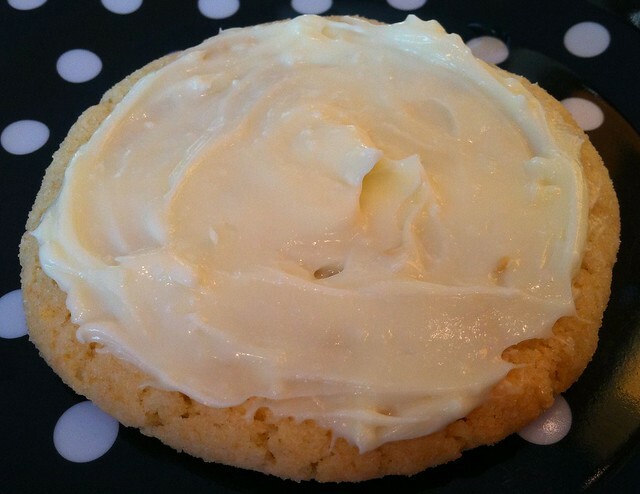 I followed Chewy Lime Coconut Cookies at Tracey’s Culinary Adventures because I liked the way her blog was organized best. So here you are…. So i made 24 good sized cookies, but you can make your cookie dough into whatever shape you like. While they are in the oven, prepare the following. fruits of your choice. 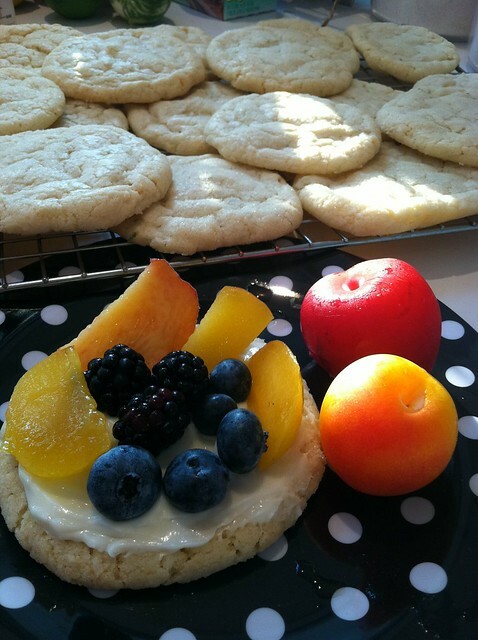 In this case, i wanted to do something new and sweet with my CSA plums, peaches and berries. Kiwi and pineapple are nice as well, but stay away from things like apples and bananas that will just be insta-brown smush. If you are planning to travel with these or need them to last longer than a few hours, then you will need to coat them with a citrus glaze. I use this when i am making the larger version, but in this case, i made all 3 components separately and am assembling as I go so they can all be different and fresh. cook top 4 ingredients in a sauce pan at medium heat until sugar is dissolved and then add cornstarch, stir until slightly thick, then pour over your fully prepared “pizza” and let set. Nutrition – raw fruit is good for you! But may cause diabetes. This is definitely the sugariest recipe i have ever made, and probably ever will. Pingback: CSA 5 + 4th of July | ugly food tastes better.